In April 2017 a consultant enquired about the use of a GCCM (Geosynthetic Cementitious Composite mat) in rehabilitating an eroding drainage channel for a local government authority, which they thought would be an economical solution to their problem. The channel was to be 3.2 m wide crest to crest and 100 m long. The objective was for the channel to be installed up stream of a new guardrail installation and to protect the new guardrail footings from being scoured in the event of a heavy rainfall event. During discussions with Geofabrics it was evident that Concrete Canvas would be an excellent solution. Geofabrics and Concrete Canvas worked together to recommend the most suitable grade (CC8) and to give an estimated bill of quantities, to calculate the quantity of material and ancillary products required at the feasabilty stage, along with typical drawings and specification. Geofabrics, also provided the installation guidelines, animated installation video and specification methodology to help with the tender process. Construction started in July with the channel firstly shaped to the required profile then the Concrete Canvas was supplied and installed on bulk rolls. The CC8 was mounted onto a spreader beam frame and cut to the exact length required using knives, eliminating waste and accommodating any variations in the channel profile. Overlapped in the direction of water flow by 100 mm, adjacent layers were screwed together using stainless steel screws at 200 mm centres s along with 8mm beads of Clearfix 600 mL tubes which is an adhesive/sealant that has been tested for its peel strength and shear strength when used in conjunction with Concrete Canvas. The outside edges of the Concrete Canvas layers were captured in a backfilled anchor trench after being pinned to the ground using 380 mm steel ground pegs. Completion of the project including earthworks, installation of and hydration of the Concrete Canvas took 4 days utilising CC8 and a crew of four men utilising a 5 tonne excavator. The installation was extremely successful and based on the contractors calculations there were considerable cost savings to using Concrete Canvas compared to conventional concrete methods. The contractor also found the product extremely easy and quick to install, leaving the contractor keen to use the product on other projects. 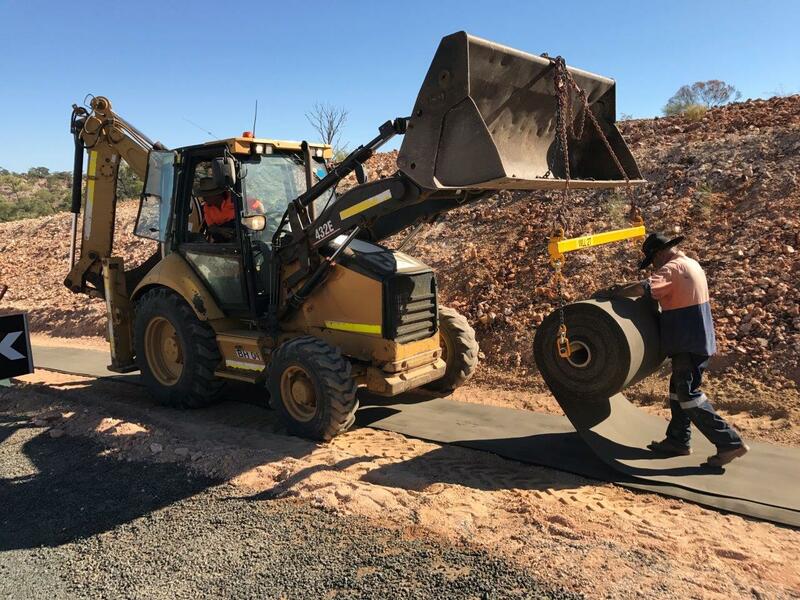 Concrete Canvas’s main advantages over conventional concrete are speed and ease of install, however in in regional areas considerable logistical cost savings can be made. CC8 is commonly used in hydraulic applications and has been tested to handle up to 8.6 m/sec of flow.